Etienne Ruvebana studied Law at the National University of Rwanda (LL.B, 2004). He did his LL.M in international law and the law of international organisations at the University of Groningen in the Netherlands (2007). In September 2009 he started his PhD research on the prevention of genocide under international law which he successfully finished in June 2014. Before he started his PhD, he was a University Lecturer of Public Law at the Kigali Independent University in Rwanda. He also served as the head of Department of Law and Acting Dean of the Faculty of Law of that University before September 2009. In 2008, he authored a book on the responsibility of states and international organisations for the omission to prevent genocide of Tutsi in Rwanda, published in the Editions Rwandaises. In 2009 he authored an article on the protection of the environment during armed conflicts in the Revue Scientifique of the Kigali Independent University. In 2010 he authored an article on the achievements and challenges of Gacaca Courts in Rwanda in solving the extreme legal and social problems of genocide, published by the Commission Nationale de Lutte contre le Genocide. In 2011, he authored a chapter on Victims of the Genocide Against the Tutsis in Rwanda, published by Intersentia. In 2013, he co-authored an article on the legacy of Gacaca Courts in Rwanda, published by the International Criminal Law Review. In 2014, Intersentia published his PhD book in the series of the School of Human Rights Research. 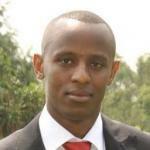 In 2014, he got appointed as Lecturer in the School of Law of the University of Rwanda. In addition to his PhD fields of research, his interests include the responsibility of states and international organisations for their wrongful acts, the use of force in international law and criminal international law.